Crickets are part of the intricate tapestry that makes up a beautiful summer evening. Sitting in the yard in your favorite chair, sipping a drink as you watch the sun drop towards the treetops and listening to the chirp of crickets in the grass; it’s one of those scenes that make all the work you do in your yard worthwhile. But what if the crickets get into your house? That constant chirping might be pleasant outdoors, but when it’s constantly coming from the walls it’s a completely different matter. A few crickets can make a lot of noise – and if they invade your home it won’t stop at a few. 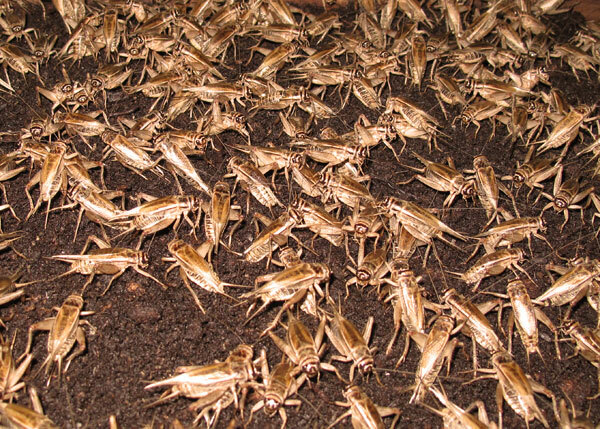 Crickets can breed prodigiously, and if you don’t get the infestation dealt with quickly you can find yourself sharing your house with hundreds of crickets. The racket can be deafening, and that’s just the start of your problems. Crickets get hungry, and they’ll eat practically anything. They can gnaw through food packaging to get at the contents, and they’re also happy to chew up your clothes, furniture and insulation. Given long enough they can even do serious damage to your walls. If you find crickets have moved in with you it’s vital to get rid of them as quickly as possible. If you’ve been invaded the chances are you won’t see very many crickets. You’ll definitely hear them, and find the damage they do, but the insects themselves are elusive. They like to hide in corners, and travel around inconspicuously. They can also squeeze in through tiny gaps, so the first step to keeping your home cricket-free is to seal off their entry routes. Fit screens to your windows, and get a screen door. If any external doors – including the screen – have gaps at the bottom fit draft excluders to close them off. Make sure your window frames are well caulked, and if you have old wooden frames with gaps look at fitting draft-proofing strips – they’ll cut your heating and air conditioning bills as well as keeping insects out. Finally look for any cracks or gaps in your walls and caulk those too. It can be a major task sealing up every entry point in an old timber house, but it’s well worth if – lots of pests can make their way in, and you’ll have far more trouble getting rid of them when they do. So it’s become obvious that crickets have found their way into your home – what next? A good option is simple bug spray. Crickets are insects, and that means most general-purpose bug sprays will kill them. You can get special sprays intended for crickets but most of the time a can of Raid will work just as well. Spray anywhere you’ve seen crickets. Then concentrate on corners, around windowsills and along the edges of floors. If there are any gaps you think they might be entering by aim a good blast in there as well. Just be careful of pets and plants – bug sprays are toxic. Once you’ve treated a room stay out of it for a while to let the fumes settle, and be very careful if you keep fish – bug spray can have a devastating effect on them. In fact if you have pets or small kids you may want to skip this plan altogether. Don’t worry – there are alternatives. You can buy indoor cricket baits, which usually come in small dishes; the crickets jump into the dish then can’t get out again. These are often toxic though, so you might want to try a safe, home-made alterative. Get a shallow bowl and put a few spoonfuls of molasses in. Then fill the bowl about halfway with water. Crickets love molasses and the smell will attract them – but when they jump in to get it they’ll drown, because they can’t jump back out once they’re in the water. Best of all, baits like this are completely safe for kids and animals. Place them in corners or around areas with cricket damage for best results. Another option is sticky traps. These are small boxes or trays with a non-toxic, sticky lining. They’re usually scented to attract crickets and other insects, which then get caught on the glue. They’re cheap, safe and last a couple of months – or until they’re completely full of stuck bugs, of course. Again put them in problem areas, and if they don’t catch anything at first move them around until they do. Dealing with the crickets themselves isn’t enough to solve the problem. They also lay eggs, and these can take up to a year to hatch. Bug spray might kill them, because the eggs do have to breathe. Crickets tend to lay eggs along baseboards, so spray those areas thoroughly. Alternatively a high-efficiency vacuum cleaner with a HEPA filter should get rid of them. Just make sure to dispose of what you’ve vacuumed in a sealed bag, in case any eggs hatch before you dispose of it. Finally, once you’ve eliminated crickets from your home, look at making your yard less friendly for them. It’s impossible to completely eliminate them from outdoors – and summer days would be poorer if you did – but you can prevent a major infestation. Non-toxic baits are available, but expensive. Instead mow long grass, where they like to nest. Replace bright outdoor lights – which attract them – with bug lights or amber LED lamps, and draw curtains or shades at night to prevent them clustering round your windows. Put tight-fitting lids on your trash cans, otherwise hungry crickets will be drawn to them. Crickets are also favorite prey for many larger animals. Attract birds to your yard with a bird feeder (make sure to protect it against squirrels and chipmunks) – many birds will happily eat any cricket they see. Spiders are another major cricket predator, so if you see any webs outdoors leave them in peace. Most lizards hunt crickets, and even your cat will happily munch them if it gets the chance. Anything that eats crickets will deter them from your property, so encourage those predators and help keep your home cricket-free! I live in a top floor apartment. There’s an air-inlet to the duct located on the ceiling of my living room. There are HOUSE CRICKETS inside the air-inlet duct. What’s bothering me is that these crickets CHIRP all night long for several hours and it’s very annoying. Although I have installed a mesh screen at the air-inlet preventing them from coming inside my living room, but this does not eliminate the chirping sound. Would you please tell me what should I do to stop the chirping sound? We have just bought land with pine trees on it. Now they are infested with crickets. what can I spray them with to geet rid of them and not harm the trees and their nuts.